All written consultations will be in English language. All consultations are hand-written documents after thorough analysis of charts by myself. "It is not a software generated report". Considering my current schedule and pending appointments, you should get written report within 15 days of applying for consultation. For any consultation, please make respective payment via options given below. 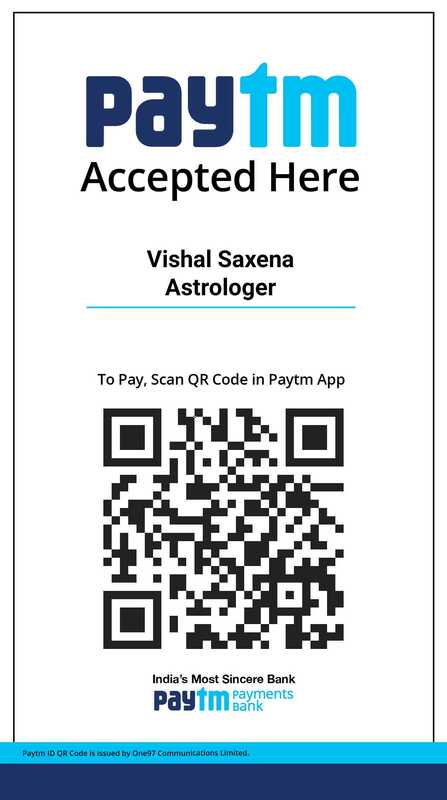 After making payment, please email me the Transaction Id, your name, your birth details and questions to astrovsaxena@gmail.com and astrovishalsaxena@gmail.com . Please send the Birth Details in following format - Date - 5th February, 1985. Time - 19.20 PM. Place - Istanbul, Turkey. Please don't send date of birth in numeric form like 05.02.1985 as it leads to confusion and clarifications as to the format is DD/MM/YYYY or MM/DD/YYYY. I hope you understand. If you are using Indian Debit/Credit Cards then you can use Pay Now button with every consultation option. If you are using International Cards then you can send payment through PayPal. My PayPal Id is astrovsaxena@gmail.com. Please email me at astrovsaxena@gmail.com, If you want to deposit directly in bank account for account details. If you are using PayTm then you can make requisite payment by scanning the below QR Code. This consultation will provide suggestions on which career path you may follow. Analysis will be done on the basic of career oriented houses (1st, 2nd, 7th& 10th), planets and combinations between them. Not only the birth horoscope but , if necessary, planetary positions in D-10 chart (which is specific chart for career) will be considered. If you want to follow any specific career then you can let me know, I will see from the prospect of that career too. Consultation Charges will be 1500 Rs/- per horoscope. One word of caution before you submit a request for Career Consultation is that many people who would be requesting for Career Consultation would be in their mid-20s. The most important change for anyone’s life, specifically career, comes in late 20s. So, right now, people requesting for Career Consultation might not be able to relate with the career which I may suggest but my opinion will be based on what your horoscope is telling as your final destination in your career rather than what you are doing now. Basically, rarely it happens that someone follows only one career throughout life. Changes and shifts are bound to come. Take my own example. I started earning by giving Tuition to school students. Then I practiced as an Advocate for about 5 years, then I taught Law at an Institute for 2 years, then I have been in Corporate World for about 5 years and now I have taken up Astrology as full time profession, which I never thought 10 years ago in my wildest dreams. So, expect a roller-coaster drive in Career matters. You can also pay through PayPal.Com My PayPal id is astrovsaxena@gmail.com . As PayPal doesn't support INR currency, you may deposit in currency applicable to you and it will be converted in INR at my end. This should be used as preferable option by people contacting from outside India as Pay Now option only accepts Indian Cards". This consultation will provide suggestions regarding the best time for receiving good alliances for marriage, which may turn out into marriage. Best time to order this consultation would be when you also have some horoscope to be matched. So that, you can get two benefits in one report. Overall, Astrology & Marriage has no relevance with each other. You can read my views on this topic here - http://astrosaxena.com/ramm ,http://astrosaxena.com/irm ,http://astrosaxena.com/d9lifepath , http://astrosaxena.com/chartmatch, and http://astrosaxena.com/2marriage . Please give 5 days’ time for consultation after submitting your birth details for proper study and research. Consultation Charges will be 500/- Rs. You can also pay through PayPal.Com My PayPal id is astrovsaxena@gmail.com . As PayPal doesn't support INR currency, you may deposit in currency applicable to you and it will be converted in INR at my end. In case, anyone requires both Career & Marriage Consultation Reports, they may choose this option. Things covered will be same as stated above for Career and Marriage Reports respectively. Consultation Charges will be 1750/- Rs. Horoscope Matching will be much more than traditional way of looking at the number of Guna matching between two horoscopes. I analyse both charts on not only if they match and marriage is possible right now but also if marriage will prosper for a long time. In case, if charts are not matching, I let people know of best times to get good alliances, so that they can be in position to decide about marriage so that they can be in position to decide about marriage. One word of guidance before you seek Horoscope Matching Consulation is that in 99% cases, I find charts not matching. So, if you are asking this consultation to get a Yes from my side, then you may be wasting your time & money. So, think twice before you ask for this consultation. If anyone is going through problems in relationship/marriage and wants to know the cause behind the problem and probable future of relationship/marriage then they can apply under this option. Consultation Charges will be 1000/- Rs. This consultation is for those who are suffering from some illness or health issue and need urgent help or guidance in this matter. This is a Free Consultation. You need not to pay anything. Please email me your birth details and questions regarding health issues at astrovsaxena@gmail.com with subject line "Health Consultation". We will schedule a telephonic consultation call as per urgency of health issues. Please don't send request under this consultation if you just want to have an idea about your overall health over a long duration of time like 5 years or 10 years. For overall health report you still need to send a request under specific consultation. This consultation is specially for those people who are suffering from an illness and need an immediate help or guidance. If anyone is not sure of their Birth Time then they can apply under this option and get the birth time rectified. It is important to give time range of 2-3 hours maximum to find the correct time of birth. Like, please give approximate time in range of 8 AM to 10 AM or 5 PM to 8 PM. Also, provide at least 5-6 important events of your life (either good or bad) which had a definite impact on your life path. I would suggest you to read this article before applying for this option - https://www.astrosaxena.com/btr. Consultation Charges will be 2000/- Rs. If anyone is interested in knowing about what next 12 months hold for them then they can apply under this option. This report will be based on your Mahadasha/Antardasha for next 12 months plus important transits during same time. In case, you want to personally meet or talk over phone to discuss your horoscope on any specific subject then please request this consultation. Please share your birth details and topic in 3 days' advance and meet/talk on that topic on given date and time. Please concise your discussion and questions on that topic only. Consultation Charges will be 1000 Rs/- per horoscope. Call for this Consultaion will be scheduled within 7 days of deposit of fee. If anyone wants guidance or suggestion on any specific topic like Overall Health Report, Foreign Travels, Child Birth Timing, Education Report, Job Change/Getting a Job Report, C-Section Muhurt, Timing of Property Gain, Mahadasha Results, Antardasha Results, Transit Results, Sadhe Sati Results, Planetary Returns (like Saturn Return, Jupiter Return or Nodes Return) Results or any specific query, then they can apply under this option. This will be a Telephonic Consultation or Consultation through Skype Call or any other Audio Medium that suits you. This consultation will provide an in-depth analysis of your horoscope. Consultation will be provided on the basis of all the 12 houses, 9 planets and 12 signs inclusive of Nakshatra and Aspects/Conjunctions of planets on each other. Every planet, sign and house of horoscope will be dealt exhaustively to give a clear and overall picture of your horoscope. I would suggest to record the call for your future reference. Consultation Charges will be 5000 Rs/- per horoscope. A word of guidance before you submit any request for Overall Horoscope Readingis that if you are looking for consultation on a specific topic like Career, Marriage etc. then you may not order Overall Horoscope Reading. For those specific requests, I have made provisions of other consultations. Please read this article before applying for Overall Consultation - http://astrosaxena.com/ocmu. If anyone is interested in learning Astrology then they may apply under this option. Regarding teaching, I don't follow any course material or curriculum. I feel that every person can be at different level of understanding Astrology and I can't teach all of them on uniform basis. So, my students usually send me their questions and doubts through email. They send in a bunch of 10 questions and I try to answer those. Fee for responding 10 questions is 1000 INR. So, it is more a doubts clearing session. It also means that you have to do self-study and I can help you with clearing your doubts. If this way of learning works with you then I will be happy to help you in learning Astrology. Another advice is not to learn from only 1 person. 1 person can’t give you whole knowledge. You have to learn from many different Astrologers and then develop your own way. As every student can be at different level of learning or understanding Astrology, I don't want to make any general rule regarding Course Material and Fees. I will interact with individual and try to see where he/she is currently in Astrological Knowledge & Understanding and from there I will guide him/her. I am fine with interacting people through Email or Skype Calls (which people can record for future references) on Astrological Lessons & Queries. Please let me know if you are interested to deep-dive in this Ocean of Astrology. Teaching Charges will be 1000/- Rs. d. In case of any query/doubt about process, you can directly email me at astrovsaxena@gmail.com. Also, there is a mobile application with name Astro Saxena which you can download from Google Play Store and contact me. In case, you opt to contact me through “Send Message” option under “CONTACT US” Tab then please provide your email address as I would be contacting through email only and please check your email account within next 24 hours. I saw your teaching section. It is mentioned that you dont provide any material or notes. In that case, before i come to you with my doubts, Can you provide some material references for me to buy and study? @ Sangeetha - pls check ur email. Sir my daughter born on 2 nd january at 12.01 am at chennai.i need to know about my husband related in her jadhagam.so much confusions. @ poorvi - pls apply for career consultation. @ Susmita - You can make horoscope by yourself on www.astrosaxena.com. You can apply for consultations as per your requirement like career, marriage, education, overall etc. Dear Sir, Are you doing Birth Time Rectification Service,if then how much you charge and let me know how long it will take?.God Blessing you!!!!!!! for your nobel service.Thanks!!!!!!! Hello sir, 1. i like to look on my birth chart regarding my current mars dasha 2. any indication of settling permanently in foreign country 3. i want to know more about my children and if there is any problem regarding 5th house 4. like to know brief about the next 5 year in career wise,marriage wise, and finance wise 5. full on brief report for the coming 25 years or more in the same topic i above mentioned. so am confused in what consultation i should take.please let me know which would be the better ONE consultation for me in the above questions. Email : spsooraj313@gmail.com Thank you. Hello sir, 1. i like to look on my birth chart regarding my current mars dasha 2. any indication of settling permanently in foreign country 3. i want to know more about my children and if there is any problem regarding 5th house 4. like to know brief about the next 5 year in career wise,marriage wise, and finance wise 5. full on brief report for the coming 25 years or more in the same topic i above mentioned. so am confused in what consultation i should take.please let me know which would be the better ONE consultation for me in the above questions. Thank you. Sir, how much do you charge for consultation services?.